Picture from simon3 : From near the summit of Gortagarry, SW.
Picture: From near the summit of Gortagarry, SW.
Gortagarry, ah yes a rare thing that, a hill entirely covered in young Sitka spruce. As of 2008 anyway from whatever side you start you have around 80 to 120m of what orienteers call "fight" to reach the summit and even then it's a little tricky to be sure you are there. Only for the purist until the trees start getting thinned. While this photo has dramatic sky it certainly wasn't taken on a clear picture postcard day. Still Gortagarry is a good place to see some of the northern mountains in the Shannon area. 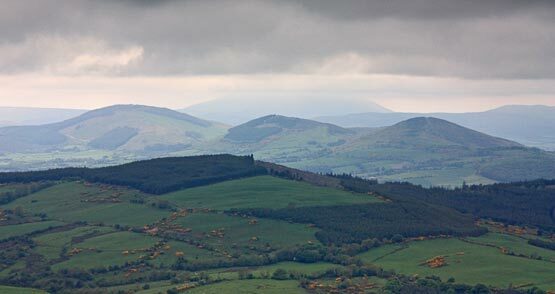 The three dancing maidens in the middle ground are, from left to right, Cooneen Hill, Ballincurra Hill and Knockadigeen Hill, all between 400 and 500m. The higher summit behind Ballincurra Hill is Keeper Hill (694m) the monarch of the Shannons. The high ground in front of Keeper and behind the three sisters are the Silvermines. The low wooded bumps nearer to us are the northern echoes of Knockanora.